Note that only the Wookie Lost Quest and the Hidden Hunters Quest can be completed after you side with Freyyr. On the other hand, The Wookie Lost Quest cannot be completed if you side with Chuundar. So it is best to complete all other side-quests before completing the Chieftain in need. Tell him to let you handle it one way or another. (Tell it to him twice for LSP). Let Zaalbar make them pay for the most DSP and battle will ensue. If you lie and make a medium persuade check to get the credits. You don't get any DSP with this method. You can gain DSP if you tell Zaalbar to shut up after blackmailing them. Stop their enslavement of Wookies for LSP. How you do this is up to you. Force persuading only works using Dominate Mind. As you can see from the above that it's best if you have Zaalbar with you for this side-quest for the extra DSP or LSP. Captain Dehno drops his Czerka Corp Resource ID which allows you to open up the Metal boxes up ahead near the supply station. However this is absolutely unnecessary as you can just bash your way into them with minimal fuss in any case. You can also slice open the boxes using supply station without the resource ID. This way actually nets you some XP unlike when you use the ID. On the way to the Czerka Offices you will see Matton Dasol slaving away a debt to Eli Gand. Obviously something funny is going on here, so it's your job to find out what that is and gain XP while you're at it. There's nothing that can be done now, so continue on with the main quest until you get access to the Upper Shadowlands. South of Jolee's hut you will find a broken droid, which will recall what happened there. Take it apart to take the Droid's head for proof of Eli's evil deed and 113 XP. Return to Eli and show him the head to prove to Matton what exactly took place. At this point you can persuade Matton to either kill or spare Eli for DSP and LSP respectively. In any case you get 638 XP for your troubles leaving Matton wondering what to do now. For some more DSP and an extra reward of a Mandalorian Assault Rifle, convince Matton to abandon Eli's shop completely. This dialog choice is only available if you persuaded Matton to kill Eli. Remember that this will prevent you from ever accessing his Eli's shop so buy whatever you want there first. If you don't convince him Matton will pay you 500 Credits for your help, but you don't gain any extra LSP for that. The Mandalorian Assault Rifle can be sold for quite a bit more than 500 Credits (especially on Yavin) so it is worth it for Dark Siders to pursue that option. You automatically get this quest when you first talk to Chuundar. You must complete this quest if you want Zaalbar back. While Zaalbar is a mediocre party member, the other quest rewards are worth finishing this quest. After talking to Chuundar talk to the female Wookie in the Village to find out that many Wookies have their doubts when it comes to Chuundar. Then continue on with the main quest, finishing Jolee's request and enter the Lower Shadowlands. Go east at the fork and continue forwards killing Kinrath until you see Freyyr to the north. Now before talking to Freyyr you may wish to go to the ritual area to the south and complete the ritual, as you don't gain any XP if you do this after you kill Freyyr. To complete the ritual kill the group of Viper Kinrath that are east of the Ritual Area. All three of them should have a Viper Kinrath Corpse you can loot off of them. Return to the ritual vine and tie the Viper Kinrath to it. When the Ritual Beast comes out of hiding, take it down. The Kill force power works especially well against it. When dead you'll get 315 XP (only if you complete it before killing Freyyr), and Bacca's Blade (not the sword) will automatically be added to your inventory. If you do this after reporting to Chuundar, you'll only get the Bacca's Blade Sword if you have Zaalbar with you due to a bug. Make sure you also loot the Ritual Beast's corpse for some great items. Anyways return to Freyyr and try to talk to him only to have him savagely attack you despite Jolee's attempt to calm him. After beating him down to a fraction of his health he'll automatically talk to you again. You can deal with him by either promising to help him or by killing him (for some DSP). Once you are finished with him several side-quests will become unavailable so make sure you're ready before doing so. If you decide to assist him you can always change your mind later on and gain even more XP that way (DSP total gained will be lower by a small amount). If you kill him you'll gain an 1125 XP bonus. Now all that's left to do is to return to the basket and talk to Gorwooken to be taken back to Chuundar automatically for a bunch of DSP and 2385 XP. You'll also get Bacca's Ceremonial Blade if you already fought the Ritual Beast. If not you'll not get anything from Chuundar (the script to give the hilt is bugged, but you can still get it as outlined above. That's why I recommend you get it first). Then you will be forever cast out of the Village of Rwookrrorro never to return. 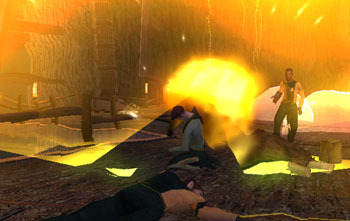 You'll also see a cut-scene in the Landing Port of an increase in slaving operations. On the other hand if you decide to help him hand him Bacca's blade which you have already found and he'll take off to Chuundar's throne room for 675 XP. Go back to the basket area and Gorwooken will attack you after chewing you out. Go ahead and mop the floor with those hairy idiots and use the basket to go back up to the Great Walkway. As you move forward you'll meet Chorrawl who will take you to the throne room automatically. You'll get to the final choice here, telling Zaalbar to side with Chuundar, Freyyr, or to try to work it out all together for some nice fuzzy warm feelings (and the most LSP). You could of course leave the decision up to Zaalbar for no change in alignment for Zaalbar to side with Freyyr (though you'll still gain the LSP later on from siding with him). In either case a battle will ensue. If you side with Freyyr all of them besides Freyyr and Zaalbar will become your enemy, otherwise you will only have to fight only Freyyr and two other Wookies. In any case once the battle is over you'll talk to whoever is left and you'll gain 3510 XP, a bunch more LSP or DSP depending on who you sided with, Zaalbar will be returned to your party, and you'll get Bacca's Ceremonial Blade in all its glory. If you sided with Chuundar you'll be expelled from the village like above. If you sided with Freyyr on returning to the Landing Port you'll see a battle raging between the Czerka guards and the Wookie Rebellion. You can help the Wookies if you wish though it is not necessary. This of course means that Matton and Eli will be gone as well. Too bad Janos and some of the other Czerka jerks aren't around for you to finish off. Also if you sided with Freyyr you can return to him and ask for credits. This will piss him off unless you have Dominate Minde and Zaalbar isn't in your party. You'll get 750 Credits and some DSP for your troubles. This is a great option for neutral Jedi as it can slightly offset the large LSP gain from siding with Freyyr. Once you are able to roam freely in the Wookie Village, go to the house just on the other side of the Chieftain's Hall to find two Wookies there who are waiting for their missing friend Rorworr. Neither of them say anything important except that he has been missing for some time. A female Wookie wandering the main area of the village says a bit more, but not much. Just go ahead and head to the Shadowlands and just north of the first fork you will find Rorworr's corpse. Loot the body for 200 XP, a bowcaster, a bowcaster bolt casing, and a slaver datapad. The datapad will tell you that Rorworr was actually a complete slimeball (similar to Chuundar) and was selling his fellow Wookies to the slavers. Head back to the village and talk show Worrroznor the casing and accuse Jaarak of the murder of Rorworr. Before doing this you can talk to Jaarak and Woorwill about the casing for different dialog options which will make it seem as though you gain more or less XP, however in the end it all ends up the same so don't worry about it. Anyways once you accuse Jaarak the trial will commence with you as the only real witness. Jaarak won't defend himself, so it's up to you to decide Jaarak's fate. Note that the dialog choice asking if there is no alternative to the death penalty gives LSP, and since you can ask it multiple times you can max out your LSP total using this. Anyways to defend Jaarak say that Rorworr was a slaver, and don't listen to Jaarak whereupon you'll gain LSP and $400, whereas if you don't defend him you'll only gain $100. This is one of the few times that choosing the Light path will net you more credits, so both light siders and neutral Jedi will want to choose this path. In either case you'll end up with a total of 1800 XP for getting through the trial. If you talked to Jaarak or Woorwill first, you'll end up with proportionately less XP thus evening it all out. As you explore the Lower Shadowlands when you first enter them you will see Mandalorians fighting a lone Wookie in a cutscene. After the one fighting goes down you can join in the fray and take the other two out. There is no hurry as the lone Wookie is technically invulnerable. Go ahead and mow the other two Mandalorians down after which Grrrwahrr will ask you to heal him. Unfortunately unless you do you won't get a reward for completing this quest, and since healing him will net you a large amount of LSP, dark siders might not be able to complete this. Anyways you can still take out the remaining Mandalorians out for XP and goodies regardless. 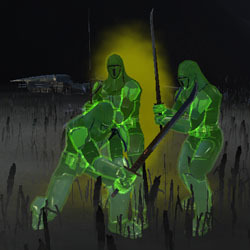 There are two areas where these camouflaged Mandalorians appear. The first group is the first fork to the southwest of Grrrwahrr and the second group is south of them. Remember that they will only decloak and attack you if your main character is unarmed (The others in your party do not need to be unarmed). The moment they appear and you regain control immediately enter you inventory and reequip yourself, and proceed to pummel them into oblivion. Unfortunately the awareness skill does not work in detecting these guys, even though it should according to the skill description. When you first pick up the datapad that they drop you'll get 50 XP. One of the Mandalorians in the second group you attack will have a swoop bike signal device. Pick that up and proceed to the swoop bikes in the west. Buff up your party and place the device in the swoop bike, after which the Mandalorian commander will appear. 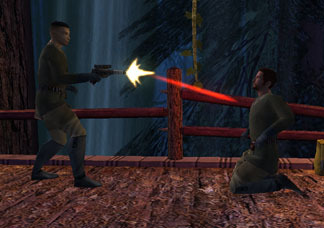 Mow down these final Mandalorian cowards and loot their corpses for 100 XP. 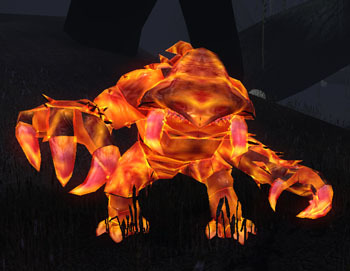 Return and report to Grrrwahrr (if you healed him) for another 350 XP and an Echani Vibroblade as your reward.